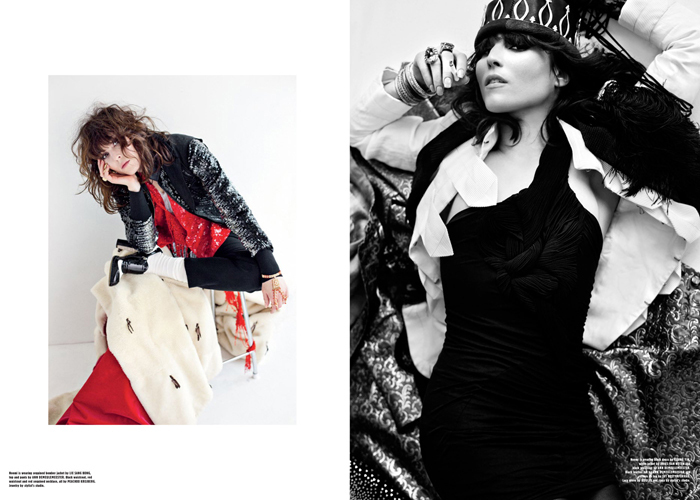 Interview with actress Noomi Rapace from the latest issue. Photography by Magnus Magnusson and fashion by Robert Rydberg. Click to read the interview. The image of her in a mohawk, with multiple piercings, a laptop under her arm, has made a strong impression; one that will be difficult to shed in the next decade. But in the wake of the brilliant and nuanced portrayal of the heroine Lisbeth Salander in The girl with the dragon tattoo, comes a breakthrough with a string of leading roles directed by some of the most prominent names in film today. ”When I get into a role I become a combination of Noomi and the character. We merge into one. My body follows my mind and adjusts accordingly,” says Noomi. When we talk on Skype in March, she has just started a three-month long shoot in Berlin with Brian de Palma. After the interview she’s off to pick up her son at school, and then on to shoot some night scenes. What is the most extreme thing you’ve done for a part? “Actually, I think I’ve gone further mentally than physically. But when I played Lisbeth I changed my body to look more boyish. In the books she isn’t quite right and seems almost like a cartoon. Very thin and petite, but still extremely strong and she can take down a gang of bikers. Sometimes that seems hard to believe. So instead of turning anorexic I wanted to become stronger, but still loose some weight. I spent seven months before we started shooting training kickboxing and Thai boxing”. In the movie a babycall monitor sets off the nerve-wrenching plot. Anna buys it to make sure nothing her 8-year-old son stays safe at night, only to find out that the babycall picks up another child crying somewhere in the apartment building. Preparing for both Babycall and now Passion, Noomi has regular conversations with Dr Clara Gumpert, associate professor and Director of the Centre for Psychiatric Research in Stockholm. Is it difficult for you privately to go in and out of character while you’re shooting? How far can the boundaries be pushed in preparing for a part? Do people expect you to go that extra mile for a part? What do you think of fashion as a way of changing your appearance? Have you been affected by the male dominance in the film industry? How do you develop as an actor? Do you ever feel kind of sad once you’ve finished playing a character? What was it like working with Ridley Scott? Do you risk getting too removed from the part if you take a long break? The movie takes place in space, was it difficult shooting it? What can you tell me about Elizabeth Shaw? Are there any similarities with Lisbeth? Interview by Antonia Nessen, photography by Magnus Magnusson, fashion by Robert Rydberg, hair by Dejan Cekanovic at LinkDetails, beauty by Sophia Eriksen at AgentBauer. Photography assistance by Ninja Hanna and Dan Sjölund, fashion assistance by Maria Barsoum, Josefine Skomars and Sara Bidemar. Special Thanks to James & Perras Studio.